The Cochineal is an insect which is famous for which the crimson dye, carmine, is derived from. This insect is actually a parasite which is native to both tropical and sub-tropical Mexico and South America. It lives on cacti and feeds on the cacti’s moisture as well as its nutrients. 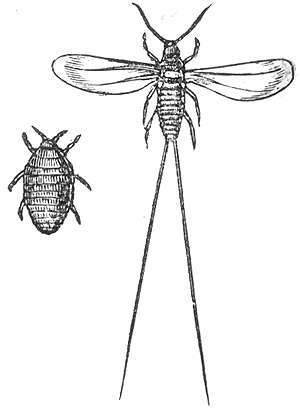 Cochineal insects are flat, have soft bodies, and are oval-shaped scale insects. Female Cochineals are wingless and are a mere 5 mm long. They will cluster around cactus pads and then penetrate the cactus with their beak-like mouthparts in order to feed on the cacti’s juices. After they mate, the female increases in size and gives birth to tiny nymphs which secrete a white, waxy substance all over their bodies to protect themselves against the sun and to reduce the loss of water. This will then make the nymphs look red while the insides of the Cochineal looks dark purple. Adult male Cochineals have wings and are smaller than its female counterpart. During the nymph stage, which is also known as the crawler stage, the Cochineal will disperse. Juveniles will move to a feeding ground to produce long wax filaments. 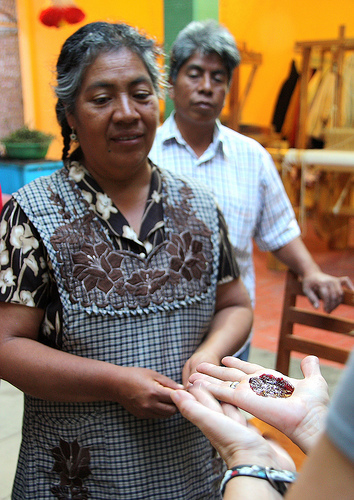 They will then use these wax filaments to carry it to a new host and establish a brand new generation of Cochineals. There are more females than males in the Cochineal population. As mentioned above, the Cochineal produces carmanic acid which is used to make carmine dye. This is actually used as a food colouring as well as cosmetics. This dye was used during the 15th century in Central America to dye clothes and were important for exports during the colonial era. This dye was also used by the Aztec and the Mayans. In fact, 11 of the cities that were conquered in the 15th century by Moctezuma were actually paid a yearly tribute of 2000 decorated cotton blankets and 40 bags of cochineal dye. During the colonial period of cochineal production, they were almost produced exclusively by the Oaxaca which were indigenous producers. It was actually Mexico’s 2nd most valued export after silver. After the Spanish conquered the Aztec Empire, it was traded as far away as India. It was such a hot item in Europe that it was actually regularly quoted in the Amsterdam and London Commodity Exchanges. In 1777, the French Botanist, Nicolas-Joseph Thiery de Menonville actually smuggled these insects to Saint Domingue. However, they were unable to propagate. Unfortunately, after the Mexican War of Independence in the early 1800’s, the Mexican monopoly of cochineal dye came to an end. Instead, large scale producers emerged in the Canary Islands, Guatemala, North Africa, and Spain. After alizarin crimson and other artificial dyes were discovered in the 19th century in Europe, this caused a huge financial shock to Spain as this huge industry ceased to exist. This almost 100% disappeared during the 20th century. The breeding of these insects are now done to maintain tradition rather to satisfy demand. It is now commercially valuable again. Most consumers who use “E120”, “C.I. 75470”, “natural red 4”, “crimson lake”, “carmine”, “cochineal extract” or even natural colouring actually is derived from an insect. A reason for its comeback in popularity is that synthetic red dyes can be carcinogenic. The only problem with carmine dye is that it can induce an anaphylactic shock in some rare cases.